When you hear Jupiter, you immediately think of the enormous planet in our solar system. But, along the sandy beaches of the northwestern part of Palm Beach County in Florida, lies a beautiful beach town called Jupiter. So why was it named Jupiter? Did the ancient roman god of light and sky have a hand in the founding of the town? It is uncertain how the town got its name but it was thought that the Spaniards had named it Jobe (HO-bay) which means Indians because of a nearby Native American village. Then the British changed it to Jove (Latin), the Roman name of Zeus, who is also known as Jupiter. Jupiter evolved over the years and has now turned into a buzzing city while maintaining a small town feel. A day is never dull in Jupiter, fun activities are always available for residents and visitors to indulge in. Aside from the beach life, there are nightlife spots, fishing meccas, golf, baseball spring training and much more! The town does not only provide you with a perfect getaway, but it makes living a breeze. From schools to hospitals, malls to entertainment and great restaurants, Jupiter, FL has it for you. Give your family and friends a different kind of adventure, hop on a beach trail for some hiking or biking, or go kayaking on the waters of the Loxahatchee River. 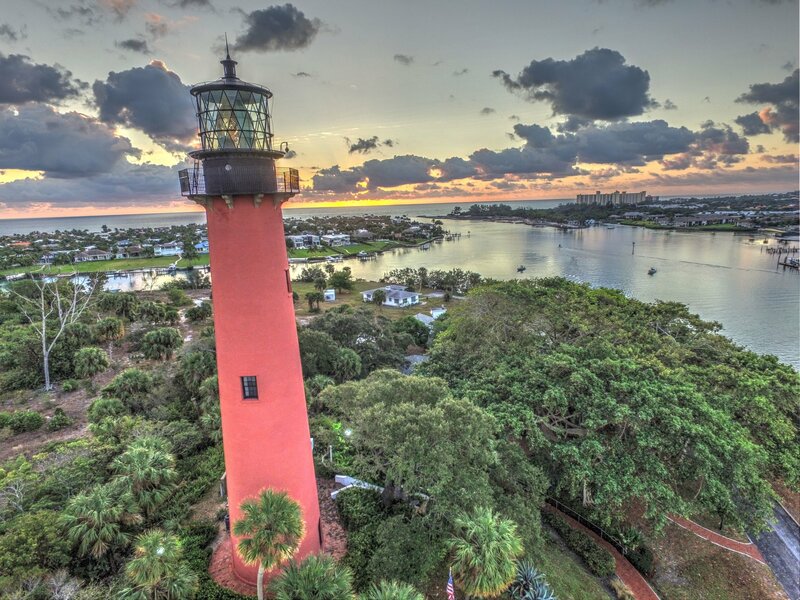 Climb the towering Jupiter Lighthouse for a breathtaking view. And...if you are up for shopping and dining, Abacoa Town Center has shops, live concerts and sidewalk dining. If you want to get in touch with the past, Jupiter has a wealth of history and historical sites. Don’t miss the Riverbend Park, Sawfish Bay Park, World War II Naval Housing Building, Jupiter Inlet Shipwrecks, Florida Historical Marker and the Inlet Village Marina and Celestial Road, all of which made a mark in Jupiter’s history. The Palm Beach International Airport, which is some 26 minutes’ drive from Jupiter, has also opened the doors to people from around the world. Paving the way of education in the area, Jupiter Elementary School was the first school ever built here back in 1927. From there on, many A-rated schools, public, private and religious alike, were built to serve the community. Much of Jupiter’s teenage population goes to Jupiter Community High and William T Dwyer High School in Jupiter and Palm Beach Gardens, respectively. Universities and Colleges are also available namely Harriet L. Wilkes Honors College and Florida Atlantic University. Jupiter, is a perfect place to live. The town has lots of amenities, low crime rates, sunny weather and a high income per capita. So, whether you are thinking about moving to Jupiter or just visiting, Jupiter is ready for you to enjoy.